If you look at me, you can’t tell something’s awry. What you see today is a woman with spiky white hair, wearing a low v-neck tee, cropped sweats, stepping into her red Impreza. 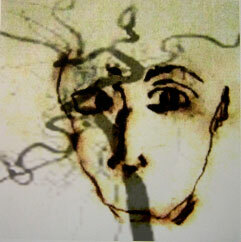 You can’t see the speech disability that I live with everyday, aphasia, from the Greek: a– without; phasis– utterance. I am perseverance incarnate, but you can’t see that either. Despite the seeming ease of these words, I am still limited. Imagine the time, the early months of 1980. The hippies are becoming the “Me Decade,” punk rock is becoming rap. We watch Dallas and Cheers; The Oprah Showhas just begun. Now see a young woman just off a trans-Atlantic flight, a casual black pants suit and a couple of bags slung across her shoulder. A new Ph.D., she is quietly full of herself. She has just presented her first paper to a research conference in Portugal. She teaches psychiatrists, supervises doctoral candidates, has a small private practice. She is living her dream. She walks briskly down a hallway toward customs. She had a bad headache during the extra day of vacation and felt a bit sick during the flight. Still, she is happy. Still standing, my body folds in half …my eyes open inches from my toes …Why can’t I hear?…then I hear like through a fish tank. My bags every-which-way across the floor, then my hearing clears as I stand and turn to my companion. “Noooo,” I say. She chats about luggage, passports, anything to soften the charged air of desperation around me. She gets us through customs. I am falling into a daze. I can’t grasp what is happening. Catastrophe. The breath in my chest is blurry, edgy. I am terrified. I am thinking …but not in words. It is rush hour in New York, a monsoon rain, AND there is a subway strike. It is a long way to the hospital. This is where I come from, 28 years ago. The rubble and the chaos in the aftermath of a stroke—the surprise, the dislocation, the fear, the loss, and then more loss—are the building materials for the rest of my life. There is surgery to repair the damage in my brain, but my speech is still impaired; finding words for even a brief sentence is laborious, and I lose a promising academic research career. I can’t do my checkbook, let alone do baby research. I have to earn a living, so I return innocently to my small practice. As a psychoanalyst I think saying few words will do. Almost a year later a colleague urges me to see a speech pathologist because I’m unraveling in fatigue and think that I must be depressed. I tell the pathologist about the enormous effort to see just a few patients. She says, “You are doing what you can’t do—and doing it anyway.” I am startled that being a psychologist and being aphasic don’t go together. But she does not dissuade me from continuing. She talks to me as though she has been here herself. She tells me that she won’t do ordinary speech therapy with me, but instead she’ll teach me how to remodel my life and space out activities to give rest to my brain. I learn to cut to bare bones, and choose only the core of what I want. Best of all she tells me, “Do any of the arts that please you, and do them a lot.” I am astonished—the prescription she has given me is for pleasure! Before the stroke I made private little ink drawings of airy grasses with their curving blades, pyramids of seed clusters, and closed heads of dandelions waiting to burst into globes. I was shy about these drawings, surprised that I could do them at all. Nevertheless, given the prescription, I am bold and sign up for a class at a choice art school. I am afraid of speaking to strangers alone, fear makes the few words I have fly away like dust, and I feel like an art dunce amid the art majors. 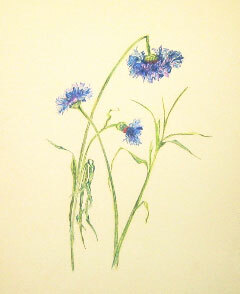 I get through a color theory class with the pleasure I wanted, then go on to flower drawing, a step up from weeds. I work with colored pencils, making spikes of purple asters suspended on the page with bits of lavender and white and dark red for a tiny petal turning dead. The teacher hangs our work on the wall for the last part of each class. She shows us the special ways each of us looked at the same vase of flowers, and drew different visions from it. This is a profound lesson for me, this intimate act of private seeing. No “right” way, only the personal way. Now, everywhere I listen to music: in the streets, on the subway, and especially between patients. I plug a Baroque chamber soundscape into my head with a Walkman. The chaotic sounds of the city disengage from my body, and my brain floats free in Hayden or Corelli. The sound smoothes on like a salve against the battered walls of my aching brain. I have believed that words, good sturdy words, were core to my existence. To articulate thought is to be alive, to be seen, in the world. Now I am learning other ways of being. From drawing I ease into watercolor painting, tiny brushes and delicate forms, a cluster of daisies with pinks and burnished purples. My next teacher supports personal experiment, seeing in the mind. This is daunting; I don’t know what I want to do, let alone experiment, or see that way. Still, I stay. I move to bigger brushes, larger forms. One day he lends me a book of Japanese paintings. “Here, Ruth, look at these. Find the work that is like yours.” I take the book home, but I don’t find anything remotely like my work. What can he be thinking? He shows me a corner of a painting, simple, messy rocks lying in a stream. These beautiful rocks touch me so much that I leave my flirtation with fragile and delicate and begin to embrace bold and messy. The pieces of paper get bigger and bigger, the flowers more voluptuous, less tied to the specifics. Now they are flowers in my mind without a vase. It is here I begin to follow the thread of my own seeing. Red tulips travel up the paper in angled lines, surrounded by light yellow and white blossoms, the paper wetted to soften edges of color, at once creating bold and ethereal. I come to class, left brain exhausted, but leave rested and exhilarated. Although my speech is still halting, my brain is balanced …and I am happy. A few years after the stroke, my daughter invites me to go with her to a Robert Bly conference with poets and Jungians and a lot of complex talk. The effort of so much listening undoes my verbal brain. I escape to the surrounding woods and make little paintings of granite rocks, loamy forest floor, nestled weeds. Without consciousness of the Japanese painting of rocks in a steam, I have made my own vision of careless, handsome rocks among the trees. My mind calms as my seeing and my spirit extend out into the woods. I try to assert my professional life and go to a conference in Europe to give a paper. Again I exhaust myself, and this time escape to a museum. I look at all the paintings in the many galleries as though quenching thirst. My eyes are filled with images of draping: the fall of a cloth from a round table, the draping of a woman’s skirt and shawl in a Victorian drawing room, the folds of a man’s breeches. From the museum I go to a park where people lounge in the summertime grass, and I make little sketches, seeing how clothes fall on a body, how the draping defines its shape. These are experiments, not having done figure drawing before; I am still thirsty from the luscious details my eyes and mind sought in the museum. Back in New York I make quick sketches on the subway. Shoes are wonderfully intimate and unobtrusive to draw without crossing the boundary of subway privacy. I see the jaunt of a woman’s back, the curved shape of her coat as she walks down the street, or what happens to a print in the folds of a dress when a woman sits on a park bench. Like the music, the art softens the rushing torrent of words in my mind. My brain practices incessantly, looking for words, shaping sentences; the torrent doesn’t stop. But if I paint, it doesn’t matter what I am painting or looking at, my brain gets great rest and pleasure. Now my speech is slow but fluid enough so that strangers don’t notice I’m disabled. I come across as “thoughtful,” a good quality in a clinician. This is not so good, though, out in the world of shopping and needing help, and I still don’t fare well at parties or professional gatherings. I feel invisible. If you don’t talk, you aren’t there. One afternoon I’m so tired I can’t drag my body to class. But I must paint! I jerry-rig a place to work at home and use rags to paint. The first gesture on the paper is clumsy; I scrub it out and create a mess, not a useful botch. Desperate, I begin again on a new piece of expensive paper. 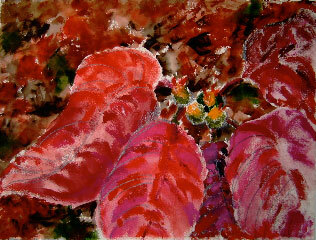 I have a vision of swirling patterns, poinsettia leaves with their tiny orangey flowerettes in the center. I paint the veins of the leaves in wide gestures of blue-reds, orangey-reds, purples, splotches of white paper showing through. With a carbon pencil I harshly trace the swirls of leaves now flowing around the coarse paper. It is the vision I had to begin with but wilder and rougher in the actuality. The next day I put in a dense vegetative background of browns, greens and black to complete the painting. I have not done this before. It’s an experiment, but it works. I paint from the terrible damage to my brain; the intensity of fatigue, flowing through arms and hands, becomes passion on the paper. I paint into the joy of being alive, into the wild urgency to speak. Death slammed my brain and thrust me into life. I have crossed a border; I have become a painter. I am seeing life in fewer words. I feel what I see. Nine years after the stroke, I have to move. My lungs are in constant flames, and my body is exhausted from the city’s energy. I move way out to the Pacific Northwest, where the verbal culture is easier and more forgiving. I find a young painting buddy. She has lost her husband to cancer. Together we bring death consciously into the paintings we make. For a while we paint on the same piece of paper, alternating: I, with brash gestural strokes, and she, with contained abstract shapes. The painting is like a dance—deep, crazy, and fun. Now I am willing to experience the daily soft presence of death that lives in my brain. The inner composition from thought to words is still a labor, but now I gather radiant words. 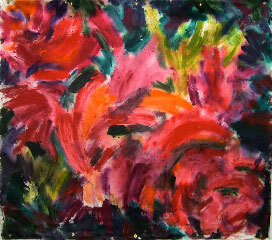 My paintings, too, live in an ecstatic place between death and life. I begin painting on large pieces of art-quality canvas that I buy from a tent and awning company in town. The work wants to be larger than the paper I can get. I experiment with quartets, a painting that crosses four pieces of paper or canvas. Each section is organized so that it can stand alone. This quartet is a huge tulip-rose shape that blazes out of the lower center in many reds flowing into yellows—like flames in a setting of passionate vitality—deep purples, and orangey-brown with a little green and black. After a couple of years I buy an old 1906 cottage with large mullioned windows and two stately Douglas firs in front. I am curious about the house’s story and I prowl the library to find that a young carpenter built it because he got a supervisor’s job and could afford to create his own house. I feel his enthusiasm and love poured into the walls of the house. I realize that I am a new person here. I’m like a lizard that has lost a foot and grows another. I lost speech but grew feelers waving in the air and new probing eyes. I make remodels to the house, uncovering paneled walls, a window, a doorsill. Underneath the layers of change, I see the house he built, facing into what was then fields. I feel the sweetness of light falling softly across the angles of her walls, the airiness of the gabled roof at the top of the stairs. I begin to sense the house as a growing being. Like my cells and organs and fluid systems, she also is a collection of cells: trees, sand, metals, space, light, and water. On days when my body aches for silence and rest, she softly closes around me. I am evolving a sensory mind. One of the Douglas firs at the front of my house loses her limbs in a terrible ice storm. I set out candles in snow caves against the wind, placing them around her, making a vigil to the disrobing of her finery. Days later as I sit in meditation, drumming softly, I feel her presence reaching to surround me, to protect me for honoring her. I remember the grace of her branches leaning down to caress my face as I came into my house. Later I walk in the woods and stop to lean against a boulder. She tells me a story of rushing water and the force of an ancient glacier that pushed her far from home. I am deepening into the voice of the land. Ten years after coming west, my speech suddenly worsens and I have a new cerebral angiogram. I lie on a gurney in the lab with three monitors above me. He speaks sternly, “You have to keep quiet. This is very delicate work,” and he adds, “I will show you everything after I finish.” And he does. I fall desperately in love with these images: my brain arteries, even the staples, the place where the cut was made, removing a whole artery decades ago. The vessels are clear, delicate, and strong, magnificent in their enormous plasticity. My damaged brain is beautiful! I have an intense desire to superimpose these images on self-portraits, but the layering techniques are beyond me and I give it up for now. Two years later I have symptoms again. It is not a stroke, but I can’t figure out how to clean my kitchen, even if I want to. My mind feels paralyzed, the pleasure of being in my studio vanishes, and my arms hang limp at my side. The physical stress of this new damage hugely affects my speech, and I can only see one patient every other day. This is not a life, and I am desolate, unable to see ahead. My painting buddy, seeing into my shattered self, tells me, “Make self-portraits.” I feel ragged and estranged. I find a mirror and make quick little sketches. She is right. I make a whole series of conte crayon drawings from the first little crude sketches. Faraway eyes, one looking straight at this world and the other to some inner place or to other spheres. I see a haggard face in my mirror; I make hard lines around the eyes and mouth, wetting the paper so that the conte bleeds a little across the paper. The jaw is square and flabby. I want the drawings to be ugly, harsh, messy. They show what I feel. Instead they are delicate and beautiful in their hard truth. My life is a shambles …again. But this time I have virtuoso experience. I know well the elements of rehabilitation: challenge just enough, rest enough, and ensure pleasure in my life. To make new life, I will change everything once again. It breaks my heart to close my clinical practice. I put my sweet cottage with its exuberant garden on the market and move close to family, to a small town in the mountains. I need to feel safe. Now, I turn to the vision I’ve had for three years, the portrait with the arteries. I sit in my new studio as skylights cast soft light. I have a new computer, new art software. I am keyed up, tense. I start in one place, fumble through a nightmare maze of unfamiliar programs, fall into black holes, and wind up in another place. It is a mess! But I take a mental step back and look again. I see that it is stunning, this portrait. The conte drawing is a soft but stark face without a mouth. A large dark cerebral vessel branches across the face, each equal in dominance. The eyes look through the branches, not quite defiant but quietly exultant. My life, too, is messy, surprising, and stunning. I hear the fall wind rattling a tin roof, strong and rhythmic. It beats a wild pattern with the Aramaic chant that I am listening to. Outside the gusting wind hurries the red and orange trees around themselves. Their long branches and bright costumes make an intricate dance with the wind. Yes, I can find precious, exquisite words now; I love that. But the words are no longer what I focus on. The sensory mind is where I live. View More: Next piece "Poems from the Southern States", Home, Archive.